Fans of Google’s VR platform Daydream will be happy this week with more updates heading out. Don’t expect anything earth shattering, but there’s some decent updates here. The first is a battery indicator that shows up when you look down at the controller while you’re in the Daydream Home, Quick Settings or Play Store in VR mode. All you have to do is glance down at your controller and you’ll see a battery indicator bar with 5 levels indicating how much play time you have left. 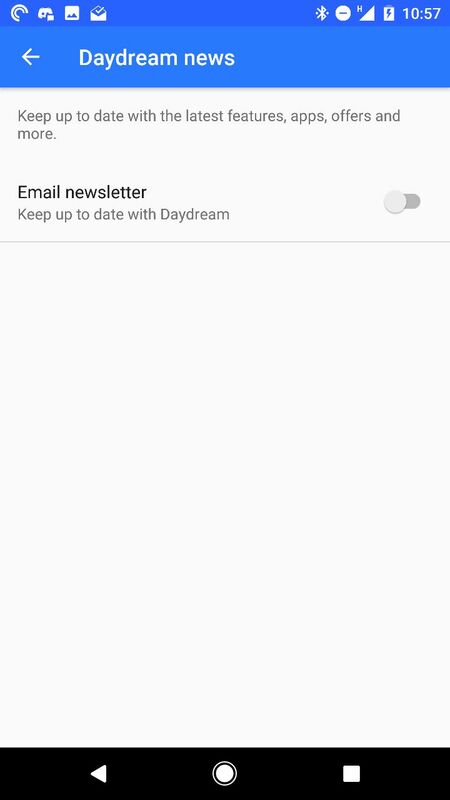 The other updates to the Daydream app include the ability to toggle a notification to receive an email which includes information about the latest features in Daydream, apps released, offers and lots more. To turn it on, open Daydream, go to Settings > Daydream News and hit the toggle. VR is an immersive experience, and Google has added a new toggle to let you turn notifications off. To get to this setting, again go to Settings and then hit the toggle. You can also choose which notifications you want, in terms of Alarms, Reminders, Events and even fine grain controls for choosing which contacts will show, or if a contact repeatedly calls – basically an emergency. As a multi-cultural nation, we should also be happy to see more language support being brought to the Daydream Keyboard. Google has updated the app with four additional languages: Korean, French, Spanish and Italian, as well as adding a new Korean language word autosuggest bar. The updates are available now, so if you go into either the Daydream or Daydream Keyboard app on any compatible phone you should be seeing these new additions now.